Amongst the many pictures that you are confronted with, while you search the World Wide Web for ‘Banaphool’, I am stuck with one. A seemingly fat man, he wears a poite (the sacred thread) and appears to be writing in a preoccupied manner. The photograph is turned at a weird angle and I am loathe to turn it straight. For a man who has written some 586 short stories (and more), all of which are poised at different angles and often end in the unexpected, looking at him from a regular perception would perhaps rob him of the unexpected. A prolific writer, Banaphool clubbed a career in medicine with that of writing and came up with novels like Trinokhondo, Boitorini Tire, Niranjana, Bhuban Som, Maharani, Agnishwar and short story collections like Bonofuler Golpo, Bonofuler Aro Golpo, Bahullo, Bindu Bishorgo, Adrisholok, Anugamini amongst others. The experience of reading Banaphool sometimes feels like being in a crowded coffee shop, finding a portly bald man next to you and looking away with not much expectancy without realizing that you are being observed with the most acute of lenses, stories about you and around you being filed away in some unseen storage space from where it shall later emerge in the shape of a miraculous tale, and in that his craft is almost magical. The hallmark of good story telling is perhaps blending in so well with the story that one cannot find the writer in it, in the case of Banaphool we see this and yet each character speaks for him and through him too. That is the reality that each reader of Banaphool, is confronted with. The easy simplicity, with which he weaves the most casual stories into something overwhelming, is nothing short of being brilliant. 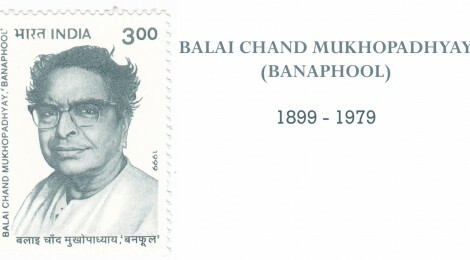 It is also the reason, why this writer has a special place in Bengali literature and amongst readers worldwide. Perhaps the most remarkable hallmark of his writing is that it is prevalent in all times and uniquely he can be read in any mood and at any time. The casual style of writing and the easy language notwithstanding, he takes along the reader in an unassuming ride often. The gamut that is Banaphool is huge, one has the impression of a man observing society around him minutely and in microscopic detail and presenting them with such casual finesse that the reader doesn’t realize it till he has read it once, stood aback not realizing what hit him and then comes back curious, to read it again. I read and re-read many of Banaphool’s stories and many a time there is something that I might have almost missed, if I hadn’t been careful. There are abrupt beginnings and even more abrupt endings, so much so that one grapples with the fact that the story has actually ended without a further conclusion. But Banaphool’s stories often don’t have a single conclusion, in that they are often open ended and open to interpretation provided one has the curiosity to go back and check, the artistic ability to comprehend and the curiosity, to not discard it as a simple story. To those who believe in the adage that simplicity is the ultimate sophistication, there could be no better example than Banaphool to illustrate the point. Though he sets his stories in the socio-economical milieu of his times, his stories are as contemporary as that of many other’s and perhaps as important today as they were in his own times. He writes on the deeper aspects of society, of the human race and much more in a style that is often laced with humor and even sarcasm. You might find him asking questions, even to the reader, so that they are compelled to answer. If stories like Tilottoma or Second to None deal with issues like men re-marrying at the drop of a hat, there are others like the story of Punti, who cannot find a decent husband since she is dark. He uses humour to plot the return of Punti with an eligible and hired husband in tow, who fools the village and yet somehow the writer manages to show her sense of anger and helplessness at society, even while the readers laugh at the trick. Often one notices fun and dark humour layered with deeper and more philosophical ideas which go a long way in enriching these stories. One is compelled to think, to speculate and return richer having been bathed in a quiet philosophy that is subtle and well placed. In The Tailor, a customer offers a substantial amount of money to a rather busy tailor to make flags that would greet Gandhi while he passes through their town’s railway station, two years have passed since that time, the same man again offers the same busy tailor extra money, only this time the flags are black. Gandhi is dead. Reading Banaphool’s stories is like taking a walk with the writer. I’ve often wondered how interesting it would be to walk with such a man, who would find stories in the most mundane and draw your attention to the smallest detail, point out the sad hidden over time, make us revel in the small joys of life and observe the little nooks where his stories lived. With Banaphool one lives anew, he teaches us that the most wonderful stories can be told in the simplest of languages and in the simplest of ways, provided we know how to appreciate them. His sudden twists and unexpectedness have earned him comparisons with O’Henry and yet his place in the history of short stories, remain unique. For a man who had written an amused poem on Rabindranath and yet drawn inspiration from him, Banaphool is one writer every reader must discover anew, for in reading him one is filled wonder and the feeling of, why didn’t I think of this.